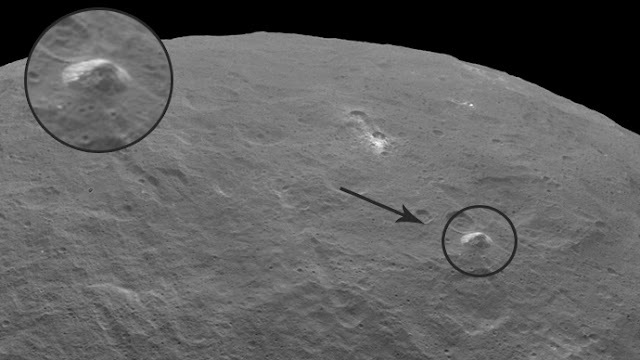 NASA’s Dawn spacecraft has been circling the Ceres dwarf planet since March 6, which is located in the asteroid belt between Mars and Jupiter. The new pictures also helped to shed some light on the planets bright spots, which are situated in a crater, which is nearly 55 miles in length. Dawn chief investigator Chris Russell of the University of California, Los Angeles said in a report last week. “The bright spots in this configuration make Ceres unique from anything we’ve seen before in the solar system. The science team is working to understand their source,” Dawn will carry on its mission on current altitude till June 30 and will continue to take pictures of Ceres. Though, it will then descend to an altitude of 900 miles (1.450 kilometers) in early August. On April 13, pictures were released from the NASA probe, which first disclosed two bright spots, which have been confusing scientists. On visible light images taken earlier, the two irregular spots appear bright white, leading to theories about so-called cryovolcanoes. But the newly-issued infrared photographs show that the spots have totally contradictory thermal properties. Researchers are still not certain if the spots are water, ice, or “hydrated minerals,” but they can say for sure that unchanging ice would be problematic so close to the sun.